Alyson Shotz "Geometry of Light"
Only last week, scientific findings were released that showed the apparent end of the light speed barrier, putting the entire modern physics world into a spin. And while those neutrinos may not have any direct impact on the art world, you can be sure artists like Alyson Shotz — who study and utilize light in their art — are paying close attention. The Brooklyn-based artist is already well-established in the States, and will get a much wider exposure this year with her exhibition “Geometry of Light”. 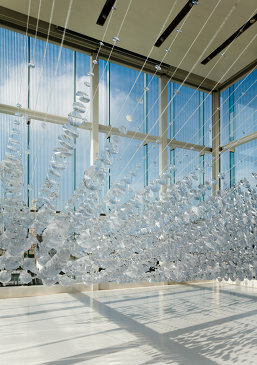 Her work is primarily with white or transparent synthetic materials. It is often scientific, even concept-heavy at times, but possesses a beauty which transcends its complex origins. Last year her “Curve in Space and Time” installation in Louis Vuitton’s Maison Kobe was one of the major talking points when the store opened. Following on from that we have another Louis Vuitton collaboration, a set of all-new work, designed specifically for their Espace art space in Omotesando. The height and natural light of the exhibition room has been used to great effect. And although the gallery is modestly-sized at best, it makes use of every inch of its floor space. Influences aside, Shotz’s work is an obvious fit with the minimalist, colourless Japanese aesthetic. The fact that every plastic Fresnal lens in the main, eponymous installation has been hand-cut is stressed in the gallery notes; but it’s their precision and presentation that will appeal to audiences here. The impact upon entrance of the piece is quite startling, and one which will change based on the time of your arrival. In the mid-afternoon sun, the gallery is bathed in dazzling light, with rays travelling through each one of the hundreds of lenses towards the viewer. The two sculptures from the “Transitional Objects” series and another sculpture called ‘Diffraction Spiral’ show off Shotz’s ability to create light in transparent sculptures both organic and geometric in shape. The effect and the variety of colours is strikingly different in both, something Shotz has taken time to develop and will no doubt explore more in her future works. The final piece ‘Coalescent’, the montage which resembles an ambient skull, has been blown up for maximum effect, filling the entire height of the room. This particular piece makes its impression through its size alone, but does gives the viewer the chance to get up close and scour the details. 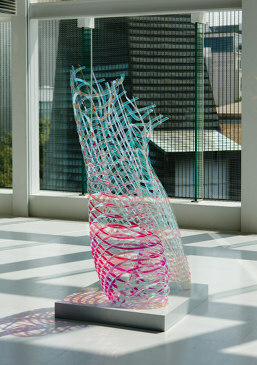 “Geometry of Light” runs to the end of the year at Espace Louis Vuitton Tokyo. Plenty of time for a new audience to discover her work, and who knows — another scientific breakthrough.